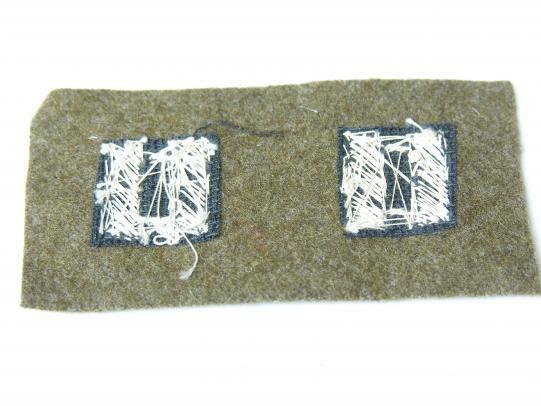 Here is a pair of un-cut Captain rank insignia, bullion embroidered on wool. Some age to the bullion thread. A matched pair of WWII U.S. Army Lieutenant Colonel Rank, pin back in sterling silver. A matched pair of Lt.Colonel. Pin Back with the snowflake pattern to the back. An unusual Gunners sweetheart in sterling silver, pin backs with safety clasps. 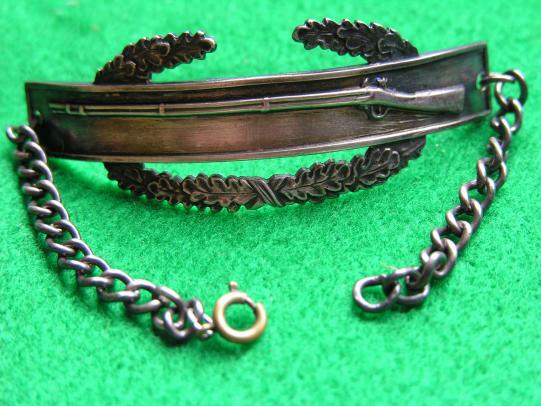 Measures 2 3/4" in length, gunner wing 3/4" with the AAF 5/8"
A period pin back Marksman qualification marked sterling with sterling silver "Rifle-B" bar by Meyer N.Y.
A pair of matching Bird Colonel rank, pin back with safety catches, cast sterling silver. Size is 1 7/8" x 3/4"
A near mint Stars and Stripes reporter shoulder sleeve Arc, yellow thread on black twill. Measures 3 1/2" x 1 3/8"
A scarce Tree Trimmers Patch, Korean made, machined on white twill material. Measures 4"
"The axe murder incident Panmunjom axe murder incident was the killing of two United States Army officers by North Korean soldiers on August 18, 1976, in the Joint Security Area (JSA) located in the Korean Demilitarized Zone (DMZ). The U.S. Army officers had been part of a work party cutting down a poplar tree in the JSA that was alleged to have been blocking the view of United Nations (U.N.) observers, when they were assaulted by the North Koreans and killed. Three days later, American and South Korean forces launched Operation Paul Bunyan, an operation that cut down the tree with a show of force to intimidate North Korea into backing down, which it did. North Korea then accepted responsibility for the earlier killings. The incident is also known alternatively as the hatchet incident, the poplar tree incident, and the tree trimming incident." 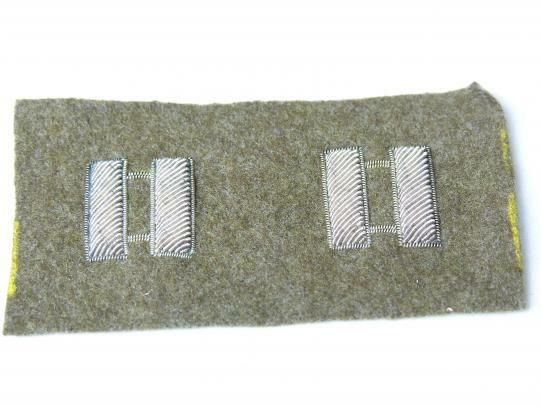 A matching pair of Captains rank insignia, pin back with safety clasp in used condition. 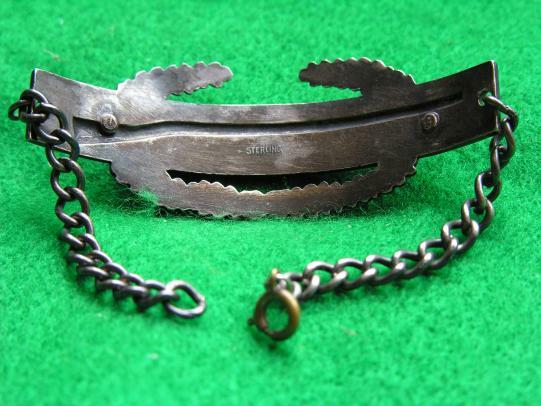 An original sterling silver Combat Infantry badge adapted into a bracelet.. Overall it measures 7 1/4" approx.